Tourism Matters | News | Opinion | Discussion | Advice | Innovation | Development: Love Fairmont - Hate Groupon! 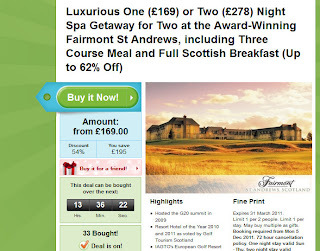 Love Fairmont - Hate Groupon! Okay, no sitting on the fence here! It won't come as much of a surprise to anyone involved in marketing hotel accommodation in Scotland has been impacted in one way or another by the plethora of Flash Sales Sites that have appeared. Good or Bad. Well in our opinion there is little doubt but we can also understand why hoteliers may wish to sell cheap at this moment in time. Understanding and agreeing with those decisions however are a little different. We posted a positive article last week when we were over in Fife at a golf launch at Fairmont St Andrews. It is a wonderful property and it is picking up awards right left and centre for its facilities and services. It was awarded Golf Tourism Scotland Golf Resort of the Year and picked up a similar accolade earlier this month from the International Association Golf Tourism Operators. But this morning saw the second Groupon offer in a month for the resort's accommodation and you can't help but wonder what the effect is on those around them. The resort of course have the freedom to act as they wish and the success of the offer is not in doubt. According to the Groupon page the first offer ended with over 800 purchases (maybe 1200 bed nights?) and the second one today will no doubt produce similar results. But how do smaller private operations deal with such price driven competition. St Andrews is a premier destination for golfers but it is also a busy leisure hotspot for short breaks and cultural escapes with perhaps the widest range of accommodation available outside of Edinburgh and Glasgow. What is the impact on the local economy on the sales of perhaps as many as 2500 five star bednights in the first three months of the year? It must impact on both the availability and rate achieved in the East Neuk of Fife, in St Andrews and even into Dundee and south and west Fife. There is also an argument that suggest that the wider impacts of such price lead promotions is detrimental to the pricing structure of other five star resorts in Scotland such as Turnberry and Gleneagles. This is not a criticism by any means it's just looking at it from the outside in. Large scale operations at five star standard who then price at three star DBB rates are inevitably going to have an impact on the businesses around them. The business is not new high end visitors coming into Scotland, or even arguably Fife, but the displacement of those from smaller operations who can't compete or gain the distribution that the bigger hotels and brands have. It is just a reality and no-one's suggesting anyone's in the wrong. It's just that for the cash strapped small hotel owner it is a very painful reality. Spare beds = low cost for the consumer. Nothing new here. Any sympathy for other St Andrews Hotels? Absolutely none. They all make hteir money in the summer when they have nothing better to do than charge top £ $ € for sub standard rooms which carry the excuse when met with complaints that "there is nothing we can do about the size of the room because of the age of the building". Lets hope a travel lodge opens up soon;that will sort out the B%Bs owners who think £100 per room per night is acceptable. From one Anon to another. A real laugh that Fife wins some international golf award recently when all it is known for overseas is rip off centre of the golfing universe. 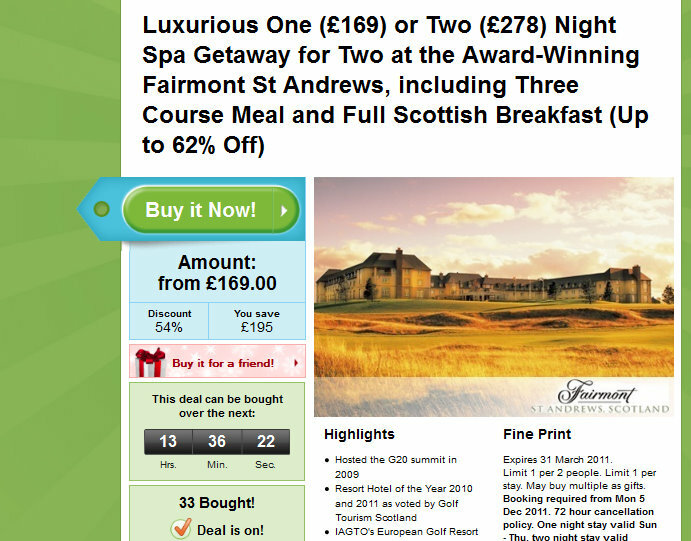 £2100 per golfer for three nights and 3 rounds of golf (Old, New, Kingsbarns). In this economic climate nothing showcases extravagance more than this. I thought £700 a room per night in London during the Olympics was bad but this is doing Scotland no favours at all. Affordable Mobile Websites are you ready? New Google Search Features Places Top Right?